We just returned from a great 6 night stay at the Hotel les Dames du Pantheon. This time in Paris we wanted to stay on the Left Bank. So after much consideration of cost, location, reviews and room configurations, I decided on this hotel and it did not disappoint. We arrived early morning and the front desk staff were very accommodating - Hugo was very gracious at check-in and even though our rooms were not ready, made sure we had some coffee and made sure they would have the rooms ready as soon as possible. They did text us when our rooms were ready (mid-morning) and had already had our bags in the rooms by the tie we got back to the hotel. We had the family room on the 3rd floor which consisted of 2 connecting rooms with 2 bathrooms, (we were 3 adults). Each room was tastefully and uniquely decorated and were very comfortable. Floor to ceiling windows with blackout curtains, cozy beds, bathrobes and slippers, towel warmer, rainshower separate from the WC in both rooms. One room had a wonderful view of the Pantheon. Oh yes - AC was great in both rooms! Lobby was inviting with a small bar and a comfortable sitting area, again with large windows looking onto the Pantheon. Breakfast room was in the stone cellar - very charming. Their had a limited selection and it was the same every day, but what they had was fresh and enough to start your day. LOVED the large cups of coffee and especially the kindness of Isabelle, who took care of everyone. Thanks Isabelle! The hotel is a few blocks from the Luxembourg Metro stop, a 10 minute quick walk to Notre Dame, and very convenient for exploring Paris. I would have no problem recommending this hotel for someone that is looking for a 4 * uniquely decorated boutique hotel in the heart of the 5th Arron. We had a really enjoyable stay at Dames du Pantheon. I really have to emphasise how wonderful the location is - truly quiet on an evening but a stroll to the heart of the Latin quarter. I'd book again for this reason alone as it's my preferred area of Paris. However, the hotel itself and the wonderful friendly and helpful staff really make the place. The rooms were really well appointed and good sized for Paris. The air conditioning was a god send in the summer heat and kept the room cool even when we were out all day, it's amazing to come back to a nice cool room. I really would recommend this hotel to anyone and look forward to staying again myself.bacon/sausage.). Staff were phenomenal-- friendly and courteous. At front desk, Karina was truly kind, exceptional. In a city where not everyone is always so friendly, the staff of Hotel les dames du Pantheon were consistently helpful and accommodating. This hotel is idea for both families and cozy enough for couples on a romantic getaway. On par with 4 star hotels in US.. would HIGHLY recommend this hotel. 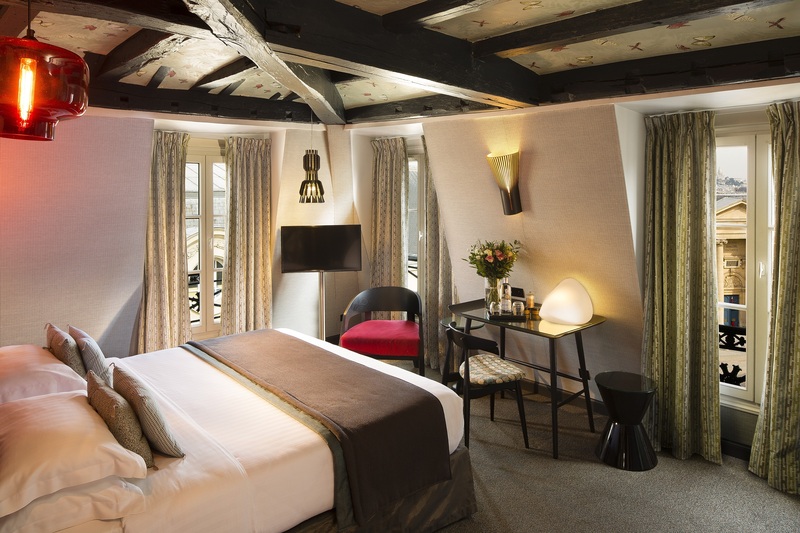 We stayed for five nights at Hotel Les Dames du Pantheon during our trip to Paris - couldn't say enough things about this hotel. From the moment of check in, the staff was friendly and helpful. They gave us great tips and had an answer to any question we had. Towards the end of our stay, my plug converter stopped working and they gave me a loaner until we left! My French is *EXTREMELY* limited but the staff spoke English which helped eased my anxiety about being in a foreign country for vacation. The room is spectacular. It's cozy - not too small which can be of concern in boutique hotels, hip, and the decor is A+. I loved looking up at the ceilings every night! The location of the hotel is PERFECT! Everything is a quick walk, bus, or train ride away - the restaurants, bars, and cafes are impeccable Also near by are pharmacies, grocery stores, and great shopping. Every morning, we were looking out onto the pantheon - a gorgeous view during our time in Paris. We were lucky enough to be there during Bastille Day and nothing will compare to sitting on the steps of the Pantheon watching fireworks over the Eiffel Tower. 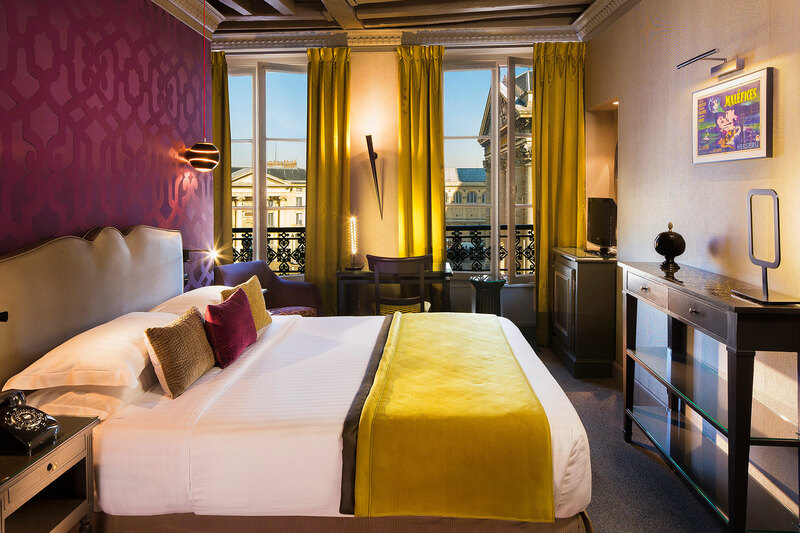 I highly recommend this hotel to friends&family and we will return for future trips to Paris! 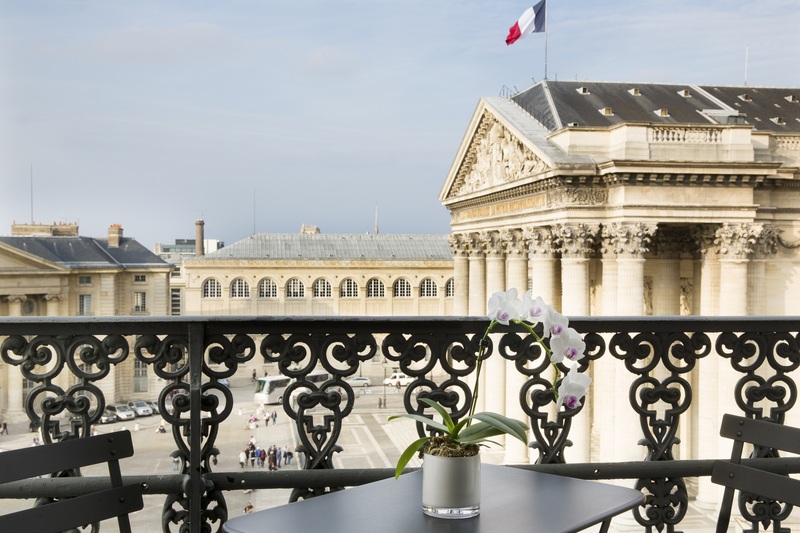 The hotel Les Dames du Pantheon is located next to its sister hotel "Grand hommes", at a corner of the Place du Pantheon. 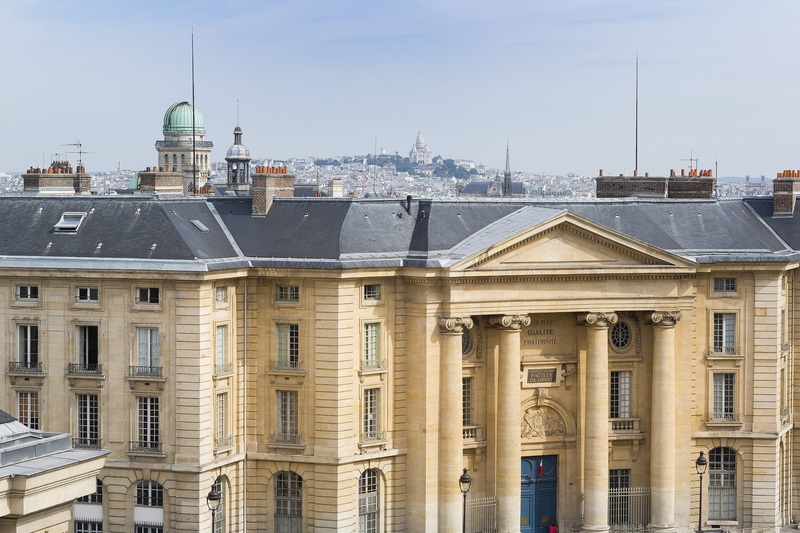 This makes its locations just 4 minutes away from the beautiful and classic Luxumburg gardens, Boulevard Saint Michel and the latin quartier with the Sorbonne University. In addition, the RER stop of line 2, direct to CDG airport, provides a breezy 40-45 minutes trip from the hotel to the airport, beating the 1 hour plus taxi ride The Latin quarter is lively and noisy until very late especially on the weekend, but just a few hundred meters away, the Pantheon square seems to be always peaceful and quiet, making the hotel ideal for tourists like me who enjoy walking to the Latin quarter or Montparnasse and return to a quiet room after dinner, music or dancing. The rooms are quite small but extremely well appointed and with beautiful accents mixing contemporary and traditional decor. The staff is attentive and kind. The view of the pantheon from the so-called superior rooms make the stay even more worth. I recommend it to couples or solo travelers. We have just got back from a weekend break in this hotel. 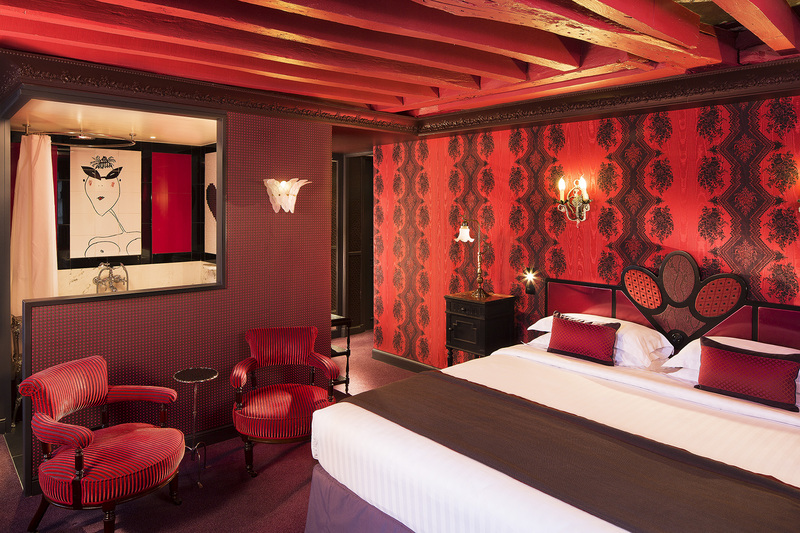 We chose to stay here based on 1. we love the Latin Quarter of Paris, 2. It is very close to the Luembourg Metro which can be gotten to from CDG Airport and also the Stade de France directly by Metro without any changing trains. On arrival there were no rooms ready but we did arrive around 11am so fully expected this, the hotel staff took in our suitcase and told us that it would be in our room ready for check-in from 2pm - when we arrived back around 2pm our room was ready and waiting for us with the case in. The room was very comfortable and beautifully decorated, as was the rest of the hotel. The staff were fantastic and even found us a travel adapter to borrow for the time we were there. If you like the Latin Quarter like we do this is the only place to stay. It's ideally situated just around the corner from the market street Rue Moffetard where there are plenty of nice places to eat or pick up picnic bits to take to one of the gardens and there's a fab craft beer bar (Brewberry) just around the corner. We will definitely be staying here for our future trips to Paris. 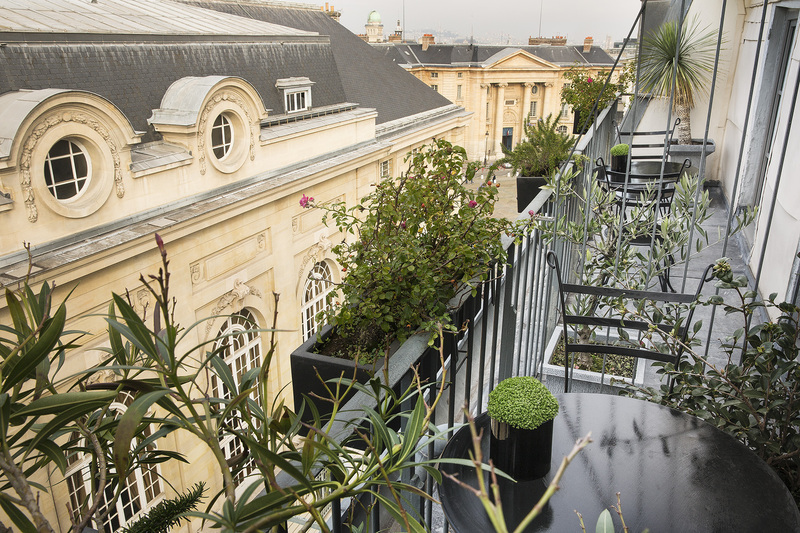 We really enjoyed our time at Hotel les Dames du Pantheon! We had connecting rooms with our teenage kids and it gave us plenty of space. The rooms were a bit larger than comparable Paris hotels that we've stayed in before. For the price, location, amenities, service, comfort, great staff...you can't do any better! I love the Latin Quarter and that area for walking about and enjoying the city. And it's a really easy spot to pick up a quick taxi anywhere. We will stay here again for sure and I've already recommended it to friends! !